Recently, Lakme launched 26 exciting new shades for their enrich satins lipsticks shades and I picked up a gorgeous color for myself as well! If you like deep red colors you are going to like it too.It was actually, love at first sight when the SA swatched it and after that he swatched some more but I knew this was it. I have been wearing this ever since I got it! So here is that pretty perky color. what you think.. Pretty! Isn’t it? 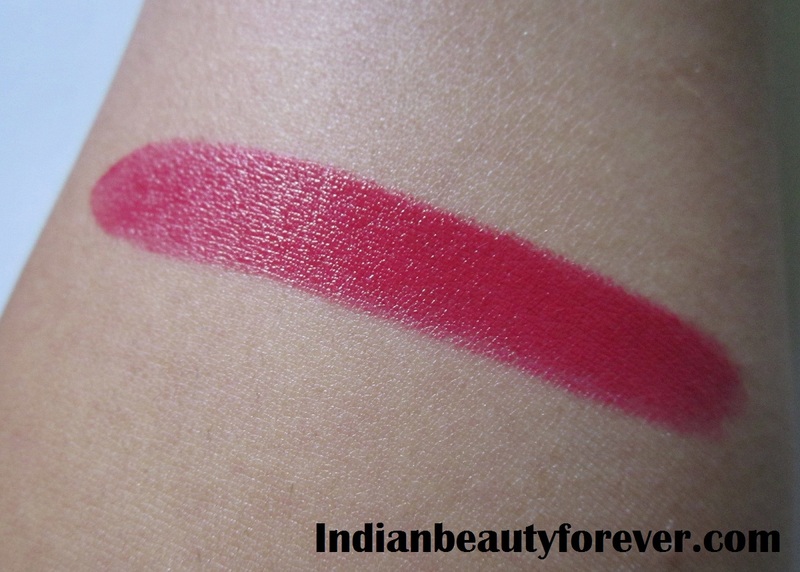 Lakme enrich satin lipsticks are priced at 225 INR for 4.3 g of product. Experience: Like all the other shades this color no 356 comes in the regular maroon rectangular packaging. Not bad but isn’t interesting either! 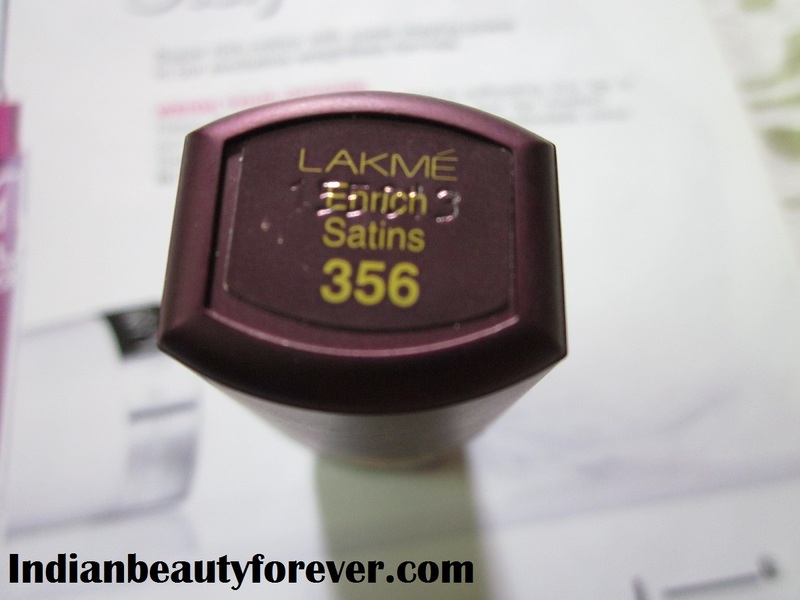 The new Lakme Enrich Satins Lipstick shades or the packaging has shade no written on both bottom and top of the tube, I noticed this while trying to open it from the other side. I though now they have put it on the top but then I came to know, it’s on the both sides!The cap closely properly and isn’t loose or anything. 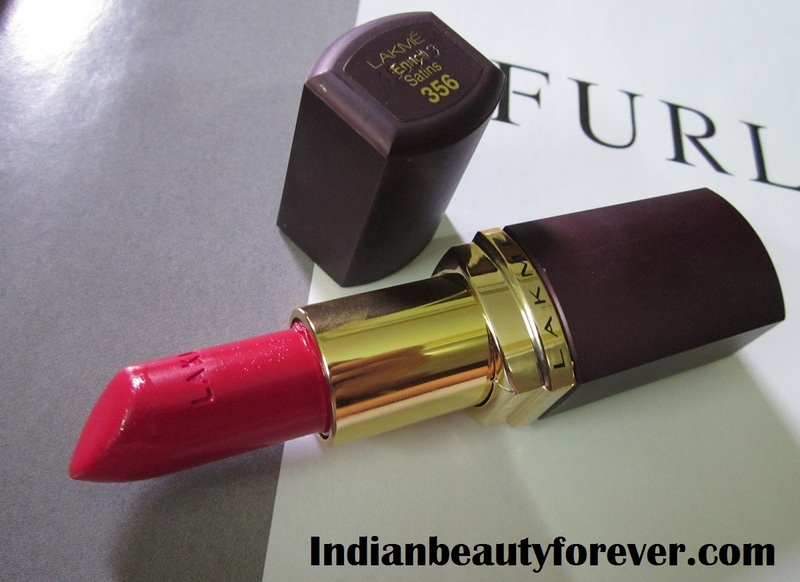 The lipstick has a fruity smell not overpowering but rather on the pleasant side. This shade 356 is a bright red in the tube and on swatching I realized it’s a blue based red. Very pretty and fantastic color!! I never really had any liking towards reds with blue undertones. I have always been more into reds with orange, pink tones, I think, my likings and loyalties have extended and now, have love them too. Liking tends to change with time!! Anyways, this lipstick like the other enrich satins that I have used, is very moisturizing and doesn’t settle into fine lines, glides smoothly like semi molten butter on your lips and doesn’t feel heavy at all, but then you have to be extra careful as it may bleed. Using a lip liner may help avoid or prevent that! Pigmentation is decent and one to two swipes will show the true intense color. It stays on my lips for a couple of hours without any meals and fades leaving a rosy stain on the lips. Overall, I love this color and the enrich satins lipsticks too and I am not paid to say this . :D It’s what I felt after using this and the couple of others earlier and even before blogging. Somehow, their texture reminds me of Maybelline moisture extreme lipsticks. I am planning to get a couple of more from the new shades soon! doesn't feel heavy on the lips at all. My take: I absolutely love this color and if you like it too then go for it. It’s affordable, creamy, moisturizing and smells good too! For the price, you won’t be disappointed! Have you tried the new Lakme Enrich Satin Lipstick shades yet?? Wow.. that's a fresh beautiful shade! :) Looks pretty on your lips! Thanks a lot Poorva,:) it's very beautiful shade. just love it!!! I love the new shades that they have launched, they are beautiful!! I am picking up few more! Its lukin so pretty on you, just wish they do something about about the packaging. I wish the same.. It's a bit boring na! Absolutely!! I just can't get over it. :) It's reallyyy pretty! Such a rich almost jewel candy apple shade, it works so well on your complexion! I swear I must pull out some brighter lip shades this summer! I've been doing so much more colorful eye looks this year i'm quite satisfied though. Lakme sounds like such a good local brand to try something from! yup!! You should definitely! They will look great on you. 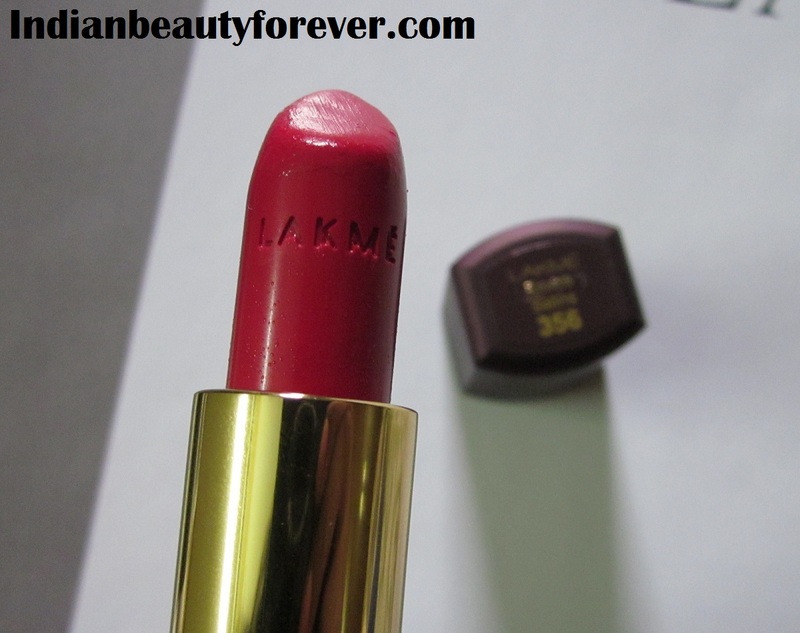 Lakme is a local Indian popular brand since 1950's! Yeah agree with you Tej, totally Hawt :)!!! That's a gorgeous shade Niesha and I love reds with blue undertones. I have a similar shade in Revlon. Its my first shade like this and really love this now. This looks like a beautiful color! Glad to hear its moisturizing as well. prettty shade..suits you soo well! Thanks Nisha! I do have fine lines but they aren't that prominent. Thank you Neha. :) Even I am looking for a pink matte shade. Thank you Natasha,:) yeah it isn't an office everyday kind of shade, their new shades have so many subtle shades too. maybe you may check out them. It looks perfect on you!!! the shade is too gorgeous!